oh, sweet joy! : bring it, november sponsors! One of the biggest blessings in running this blog is helping small businesses, handmade shops, and likeminded blogs grow and pursue their dreams. It's a win-win, really because in turn...I get to offer you guys original content for free. I think of my blog like a magazine from time to time...except you don't have to go to your nearest Target to buy a copy. You get to sit in your PJ's and read what's going on over here in Oh, Sweet Joy! land. You get my recipes, fashion inspiration, my tutorials, a peek into my life, and free stuff! It's hard work, but I truly enjoy (almost *wink*) every second of it. I couldn't do this without my sponsors. They are incredibly talented, inspiring, and endlessly supportive. I try to give that right back to them. It's truly a community in my eyes. Would you like to join this community by sponsoring Oh, Sweet Joy! in November? November and December are my largest months, traffic-wise and if you're a shop, your investment will be returned more in the coming weeks & months than any other time of the year. I'd LOVE to have your ad on the sidebar so we can grow together! 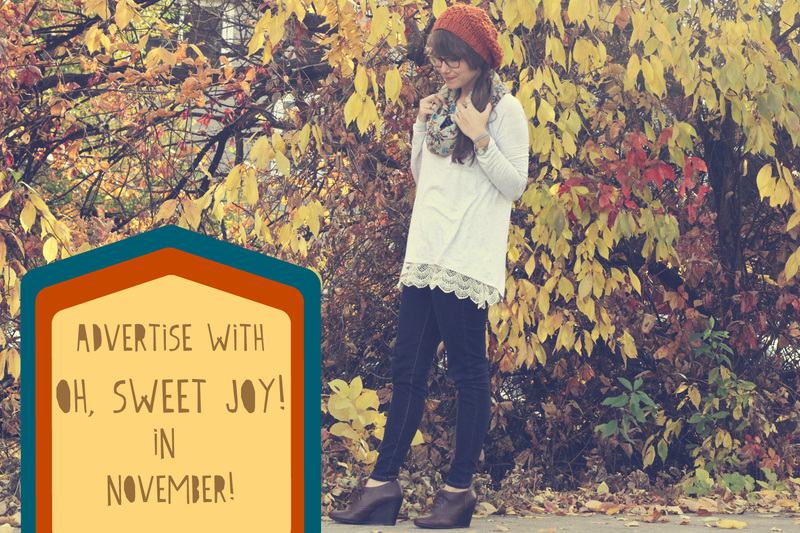 E-mail me at ohsweetjoyATgmailDOTcom for pricing, stats, and availability information.